Home » For Consumers » Where should I buy flooring products? When a customer uses a Flooring Professional they can expect to receive high quality service. You can search for a Flooring Professional in your area here. What should I expect from my Flooring Retailer? Courteous, prompt and knowledgeable service. Ask them about their industry experience and if they have any formal qualifications in flooring. Most retailers are constantly undergoing product training through their suppliers. Since 2006 a registered NZQA qualification – National Certificate in Flooring Planning and Design – has been available to all flooring retailers in New Zealand. You could ask the company you are dealing with if they have staff enrolled in this qualification or staff who have already completed it. Ask your retailer which industry standard your flooring will be installed to, especially if they are going to be arranging for the installation of your flooring for you. 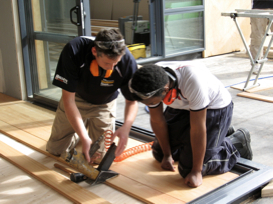 Some manufacturers link their product warranty to a specific NZ/AUS standard of installation. A professional retailer will know what these standards are and should have a copy on hand to show you. Get quotes from several retailers. A quote should give clear details of your chosen product, the work to be undertaken and clear terms of trade. Once you accept a quote, the retailer should show you a scale plan highlighting the areas into which your flooring is to be installed. All product choices and seam placements should be clearly indicated and signed off by you before the job commences. Another key indicator of the professionalism of a flooring retailer is the advice they give you in regard to the on-going care and maintenance of your flooring product.